Search by keyword above, or select a category to browse below. School improvement is everyone's job. Though the exact details of the story vary, the message remains the same. NASA and Pres. Kennedy had a vision and a dream to be the first country to land a man on the moon. That vision and dream was embraced by all in the organization, not just the astronauts or engineers. Every day, that janitor came to work to create the best work environment for others at NASA, but they were all in it together with each job helping the organization to achieve excellence. The Every Student Succeeds Act holds many opportunities for our schools, and chief among them is the same vision that drove that janitor to do his part. It is the responsibility of everyone in a school community to help improve our schools. NEA and OEA cheered when ESSA passed in December 2015. One of the overarching themes of the legislation is that ESSA returned decision making to those who know schools and students the best – the educators, community, and families in the school community. Gone are the days of No Child Left Behind where the federal government dictated the strategies schools could use to improve. Gone are the days of having to choose to close and reopen a school as a charter school or hire a new principal and staff in order to get federal improvement funds. Gone are the days of improvement decisions made behind closed doors by a select few. The new legislation mandates that school improvement decisions be made with the involvement of stakeholders. This includes classroom teachers, specialized instructors like counselors or school psychologists, paraprofessionals, families, and tribal members. ESSA also doesn’t outline a limited number of approaches to improving schools. Instead, it gives that autonomy to school communities to respond to their local need. What works in Glide might not be right for Nyssa. A strategy that works for chronic absenteeism with elementary students might not work for high school students. OEA’s in-depth overview of ESSA includes a document listing which people school and district leaders must include on what decisions and to what extent across all federal programs. ESSA is sometimes seen as only affecting schools that receive Title I money. Title I funds are federally designated to provide supplemental funds so all children have the opportunity to receive a fair, equitable, and high quality education, and to meet the education needs of students in schools with high rates of poverty. But all schools should constantly be in a state of improvement. In Oregon, every school and district is required to write and submit continuous improvement plans, also known as CIPs. The goal of this requirement is that schools and districts continuously assess student outcomes and student needs, and then act to meet those needs. As educators, we should always be looking for ways to improve teaching and learning conditions for our students. We never arrive at a place of perfection or conclude that we’re doing “good enough.” Instead, educators should strive for that man on the moon vision. Start by getting educated. Use resources available through OEA’s ESSA website or NEA’s My School, My Voice website (www.myschoolmyvoice.nea.org). Then, ask questions. Ask your principal about school improvement teams or to see the school’s improvement plan or Title I plan. Are there opportunities to join work groups or leadership teams to have your voice heard? Ask your union leaders if they are engaged in district-level conversations. Does your local association have a school improvement committee, labor management committee, or professional development committee you could join? Then, get organized and involved. If your school or district isn’t adhering to ESSA’s intent for wide stakeholder engagement, how can you organize to ensure educator, community and family voices are heard? OEA’s Educator-Led Improvement Toolkit is a great place to start organizing for educator voice. OEA staff members and leaders can also help local teams organize for educator voice. If your school and district have embraced collaboration, find ways to get involved and get your voice heard. President Kennedy had a vision to put a man on the moon. OEA has a vision to improve the future of all Oregonians through quality education. Our association can only achieve that vision if we all work together to turn that vision into a reality. 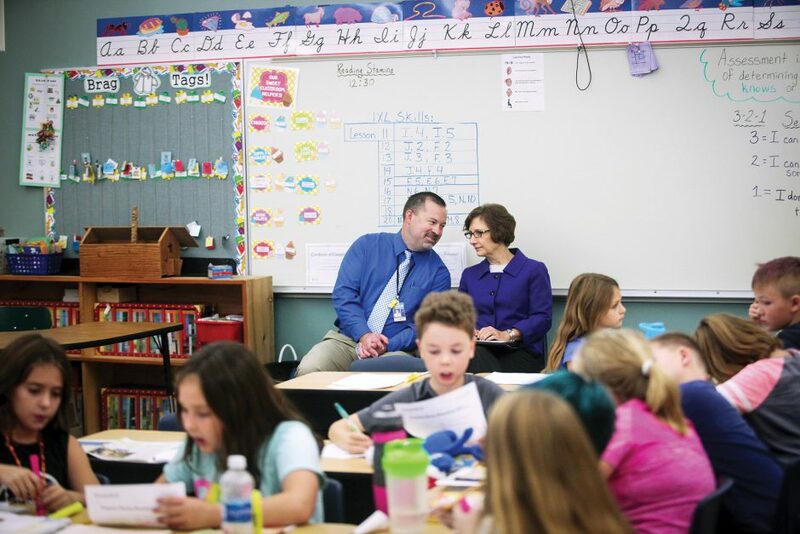 U.S. Rep. Suzanne Bonamici (D-OR 1st District) went back to the classroom in October. The congresswoman visited Lewis and Clark Elementary School in the St. Helens School District to watch educators putting quality assessment practices into place in their classrooms. OEA’s Center for Great Public Schools began a partnership with the St. Helens Education Association and the St. Helens School District in January 2016 to improve classroom assessment practices, preparing educators to lead their colleagues in professional learning and transforming learning across the district. Rep. Bonamici visited the classrooms of Catherine Contreras, 6th grade; Kathleen Alexander, 3rd grade; and Marcy Schaffer, 2nd grade. Each showcased a different aspect of quality assessment practices including students self-assessing their progress toward mastering a learning target, student engagement in a learning target, and students tracking their own progress. The Congresswoman then engaged in a roundtable discussion with educators and school leaders from each of the district’s five schools. Rep. Bonamici asked educators how these practices have impacted student learning. Contreras shared that she sees students making huge gains in their learning. Scot Stockwell, Superintendent of St. Helens, emphasized the partnership between OEA and the district as critical to the success of the work. He said that when teachers saw that the work was designed and lead by teachers, taking risks and trying new approaches to instruction became easier. Rep. Bonamici represents the northwest corner of the state including Columbia, Clatsop, Washington, Yamhill and portions of Multnomah Counties. Her regions include both the St. Helens School District and the Banks School District, which are two pilot sites for OEA’s quality assessment work. She also sits on the House Education Committee and was a key player in helping to pass the bipartisan Every Student Succeeds Act, which ended the test-and-punish era of No Child Left Behind. The Congresswoman told the educators that seeing their work in action helps her continue to make the case for increasing federal funding (like Title IIA funds that support the type of work St. Helens engaged in), and to show other lawmakers examples of emerging practices and success stories. Get Today's OEA in Your Email Inbox! Get the best of Today’s OEA every quarter – FREE. © 2019 Oregon Education Association, an affiliate of National Education Association. All rights reserved.